Our newly-launched Vintage Furniture Range is now available to order from our website. Featuring sofas, chairs, footstools, ottomans and more, the collection offers a unique choice of items, all supplied with the standard Designer Sofas For You guarantee of professional quality. This stunning piece is designed to make a statement whichever room it is placed in. Offering plenty of room for guests or even more room if you just want to snuggle up all by yourself, the corner group is just as comfortable as it looks. Whether you go for rouge, tan, tobacco, brown or black, you are sure to be impressed with the aesthetic credentials of this signature piece. 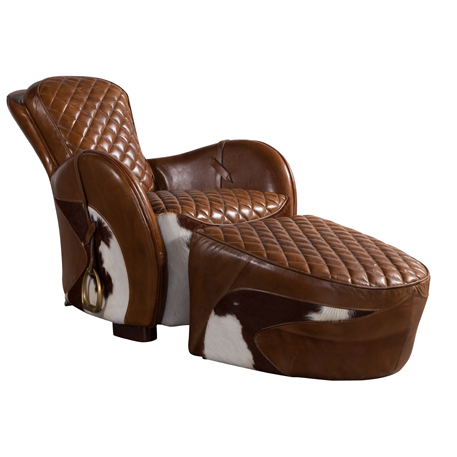 Get ready for some serious comfort with the Rodeo Saddle Vintage Lounge Leather Chair including footstool! The finest leather is used to create this stylish chair and the sumptuous design is echoed in the matching footstool. Perfect for those winter nights by the fire, this will become an instant favourite in your home. There is so much more to discover in our new vintage furniture range so browse now!